Our pooled 1000 oz silver bar option give investors the chance to start investing into physical precious metals outside the banking system in an easily reachable and low cost manner. This pooled silver option is only available to buy using Australian Dollars, but don't let that put you off as the current strength of the US Dollar could make this a great use of foreign exchange investing. The pooled investment into the 1000 oz silver bars has a lower price entry point than the pooled gold bullion option. If you have a low savings budget it provides you with a fantastic opportunity to start safely investing your money into physical precious metals. What is a Pooled Physical Bullion Bar? A pooled bar is where the bar is divided into smaller units (known as lots) without physically breaking it up. This way a single bar can be owned by as many people as there are divided units. Our pooled silver contract is sold in lots of 1 troy ounce. Your pooled silver holding comes with the added benefit of being safely stored in a secure private vault. We have and use a secure vaulting facility located in each country that the ABX's markets operate within. You also have the option to withdraw your pooled bullion as a single 1000 oz silver bar, but only after your holding has accumulated 1000 lots, and they must all be located in the same market vault. Buying into a pooled bar in no way diminishes the fact that the 1 ounce lot of silver bullion you bought is your private property and always remains 100% fully allocated. How Do We Make This Simple Low Cost Savings Solution Work for You? The Allocated Bullion Exchange (ABX) has created an innovative solution that helps to reduce the premium placed on the physical silver you buy. The ABX has arranged with their liquidity providers (refineries and mints) to supply all and any unwanted silver bars they have lying around into the vaults as long as they all meet the minimum fineness of 999. These 'knick-knacks' are used to help seed the pooled accounts. Normally a bullion provider invests their capital into a single 1000 oz silver bar after which they then wait for investors to buy into it. These bars are in high demand and so can hold a higher premium than the silver bars that aren't so highly sought after so it creates an unnecessary capital investment burden on the bullion provider. By taking in the smaller unwanted bars that the refineries have lying around, the ABX's pooled silver has a lower premium placed upon it and so costing you less to buy, thereby making it easier to get invested into physical bullion. So Where Does the 1000 Ounce Bar Fit Into All of This? Once you have accumulated 1000 pooled silver ounces in a single market location, you can then withdraw it from the vault if you wish. When you request a withdrawal, one of the liquidity providers will swap out 1000 ounces of knick-knack silver bars and replace it with a single 1000 oz silver bar, which is then sent to you. The method of using small silver bars to seed the pooled accounts in no way undermines the quality of what you are buying and there is always 1:1 amount of metal bought and held for you in the vault (100% allocation). This style of innovative investing into low premium pooled physical silver is a great, simple and reachable way to help people achieve a dream of buying into precious metals that may not otherwise have been affordable. The contract specifications relating to the pooled silver is in the table below. Our bullion catalogue holds the specifications for all of our products and also contains Appendix A mentioned in the table. Description 1 fine troy ounce silver pooled contract, consisting of silver cast bars with a minimum fineness of 999. Bearing a serial number and identifying stamp of a refiner as per Appendix A Good Delivery Refiners. 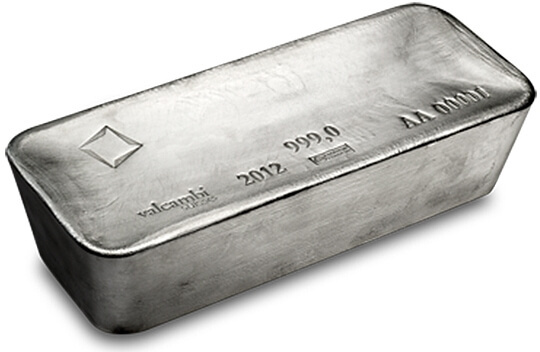 If you have any queries about our pooled 1000 oz silver bar, then do contact us.